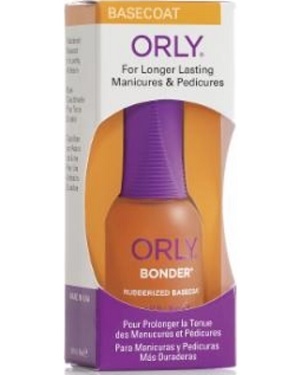 Orly Bonder Rubberized Base Coat, .60 oz. Home > Top Coats, Base Coats, Nail Treatments & Cuticle Oils > Base Coats for Long Lasting Nail Polish Manicures > Orly Bonder Rubberized Base Coat .60 oz. Grips and adheres nail polish to the nail, helps nail polish stay longer on nails and helps to prevent chips.